The Tyger is a poem by British poet William Blake. The poem is about a tiger. It is spelled with a "y" in the poem because Blake used the old English spelling. The poem was published in Blake's illustrated poetry collection, Songs Of Innocence and Of Experience, which was first published in 1789. The British Museum has a wonderful illustration of "The Tyger" poem on its listing for the work. It is from a 1794 version. The poem is in the public domain. 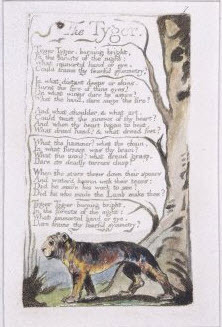 In his poem, Blake is asking what creator came up with a creature as fearsome and awesome as a tiger. He also asks if it was the same creator responsible for making the far less menacing lamb. Blake writes, "Did he who made the Lamb make thee?" Blake also wrote a poem called "The Lamb." The Wikipedia entry for "The Tyger" notes that "The Lamb" is a sister poem to "The Tyger." In "The Lamb" poem, Blake asks the lamb if it knows who its creator is. The first and sixth and final stanzas of "The Tyger" poem are near repeats. The one exception is "could frame" becomes "dare frame" in the final sentence. As in who would dare to create such a fearsome creature? Blake is thought to have been using the animals as representations of good (lamb) and evil (tiger). He is asking a very big philosophical question . How the creator of the world could create both good and evil.